Exploring the country where my surname came from and hacking collaboratively at Science Hack Day Vilnius! I love to hack stuff, and, this year, I’ve been pushing myself to do more of that along with people. That’s how I found a hackathon called Science Hack Day, a weekend event with the goal of “making weird, silly or serious things with science” in collaboration with others. Although I missed the Berlin edition for just a few days after it happened in November, another event was about to come – this time, in Lithuania, where my surname “Gurskas” came from. There it was the perfect replacement: the Science Hack Day Vilnius 2018 would be my great excuse to explore the country where my grandfather was born. Right on the last minute, I got a bedroom in a cheap hotel booked, and my flight and event tickets ready. All set for the hacking adventure! Approximately 2 hours from Berlin by plane, there I was: Vilnius, the capital of Lithuania. A modest city, so small you can pretty much explore everything by feet. Temperatures were more negative than in Berlin. Winter, and the city wasn’t the most colourful either, so the atmosphere was somewhat dark – even though the snow was painting all buildings, houses, and streets in a shining white. The cold was totally dismissible as soon as I met the Lithuanians, warm and welcoming people who seemed to lead a simple life. 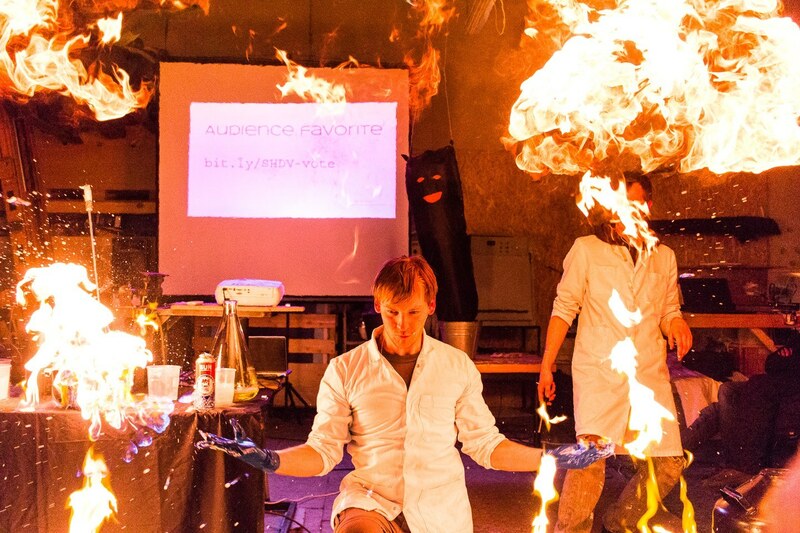 A Science Hack Day is a 2-day event run by volunteers. Since it’s a hackathon, it’s pretty hectic and leaves you exhausted at the end. However, also since it’s a hackathon, it’s remarkably rewarding at the end. Early on Saturday, I walked to Technarium, where the event would happen. 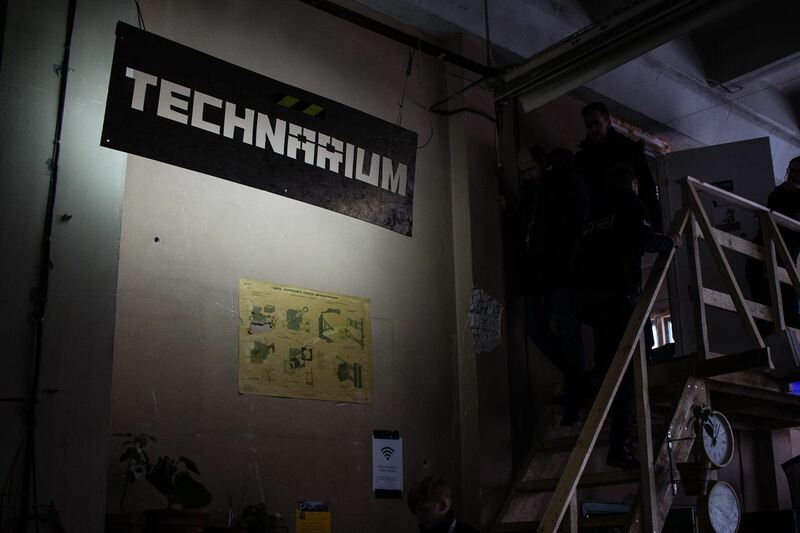 It’s a laid-back and community-operated hackerspace in Vilnius, where technology enthusiasts work or co-work on their projects and share knowledge. My perfect habitat, sort of. I found a seat in the middle of a diverse crowd of enthusiasts: kids, teenagers, and adults (in which you could also find scientists and professors). I had forgotten to adjust my clock to the local timezone when I arrived in Lithuania – 1 hour ahead of Berlin –, so I was kinda late and the talks on open science had already started. With honestly no idea on how all that’d end up (a feeling I’m used to, since I always do unexpected stuff to myself anyway), I was watching the talks and telling myself that the worst that could happen was that I’d have no idea and no team, and would end up just exploring what others were building. It didn’t sound any bad at all! Being around creative people is always appreciated anyway. 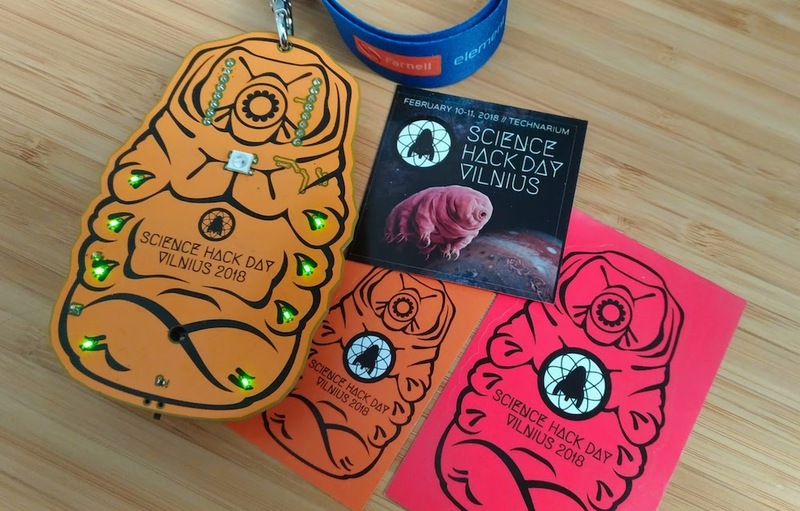 Electronic hackable badge and some stickers I got for joining the event! The badge features a WiFi-enabled micro-controller and MicroPython, for some hardware hacking fun. Check the badge's GitHub repository. After the talks, it was time for people to pitch about their potential projects. Most ideas involved Biology, Programming, Physics, Chemistry – anything related to (science) hacking! One of the ideas, from a team of 3 guys, was to build an audio visualiser. “We need a Python engineer who understands some audio engineering”, they said, in Lithuanian (thanks person who was real-time translating everything!). Luckily, in a beautiful coincidence, I love music, Python, and also have been playing with spectrum analysis for audio visualisation in the last year – so I decided to take a shot and ask them to join the team. Since Arduino Nano isn’t powerful enough for that computation, it’d be only used for data acquisition, and the spectrometer would live in our Python program in my laptop, computing the Fourier transform of the audio signals. By the end of the day, we managed to get input from the microphone, analyse its signals in the frequency domain with Python, and start mapping that data to be sent to our Arduino over a serial interface. Some libraries we played with were: pyaudio, numpy, pyserial, matplotlib. Now with the clock correctly set (thanks to my friend that asked what timezone I was in, otherwise I wouldn’t ever know), I was on my way to Technarium again, walking over and under snow in that early Sunday morning. Most people there were Lithuanians and I didn’t know anything about their language besides “labas vakaras” (“good evening”), so I felt like an outsider sometimes. My teammates and other Lithuanians in the event – including kids –, though, were friendly and spoke English flawlessly, and fortunately even translated some stuff into English for me. Curious fact: A teenager at the event told me that my surname was "wrong" – in Lithuania, single women get a different surname suffix, so my name should be Gurskaite ("skaite" suffix, instead of –kas). In Brazil, of course, they didn’t know that and only cloned my grandfather’s surname – with the "kas" suffix, since he was a man: Gurskas. More talks in the morning on open hardware and software. They introduced everyone to GitHub, and many people, even students, were already familiar with it. The importance given to open source was impressive! That made me really happy. Time flew on the second day! 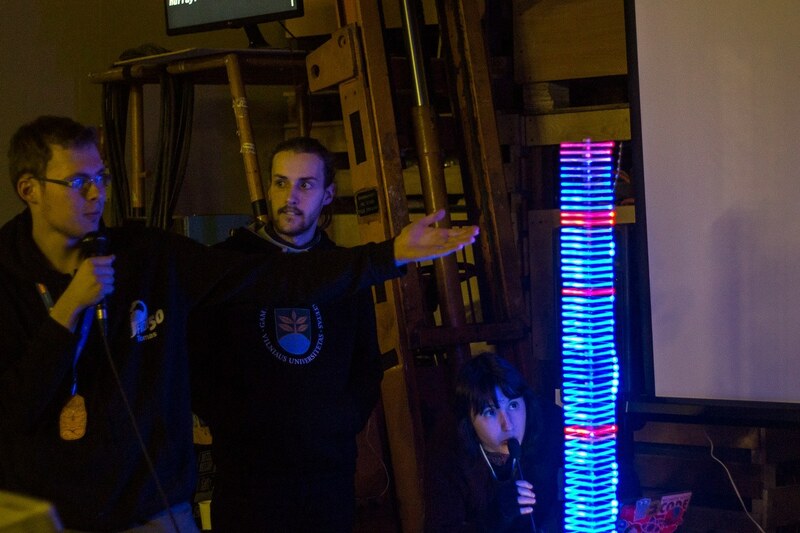 We had got the data we needed, and the next step was to decide on what would be more fun: to map amplitudes from the maximum frequency to RGB values for all LEDs, or map each LED to a frequency and change its colour depending on the amplitude? We picked up the latter, and got our LEDs to blink. We were running out of time. While 2 of my teammates were building the LED tower, the other and I were testing the code and trying to improve our algorithm, everything at the same time. 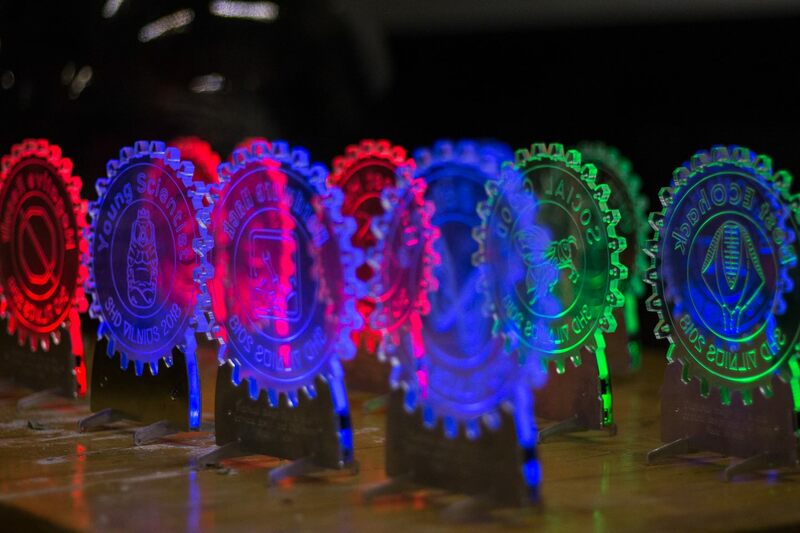 Eventually, we got our LEDs to blink the way we wanted them to, and the clock pointed 18:00 sharp. Time for presenting! Teams came up with a lot of cool things! Projects related to lasers, contactless payment systems security tests, shopping-cart-rocket launch (#SpaceXLithuania! ), plant-watering automation, posters with LEDs crafted by kids celebrating the 100th year of the Lithuanian as an independent country… And ours, of course. There were different category prizes, and we won as the Best Data Hack! I got the honor to take home not just this LED-powered trophy below, but also a memorable experience I had the pleasure to share with people I didn’t know in a country I didn’t know. 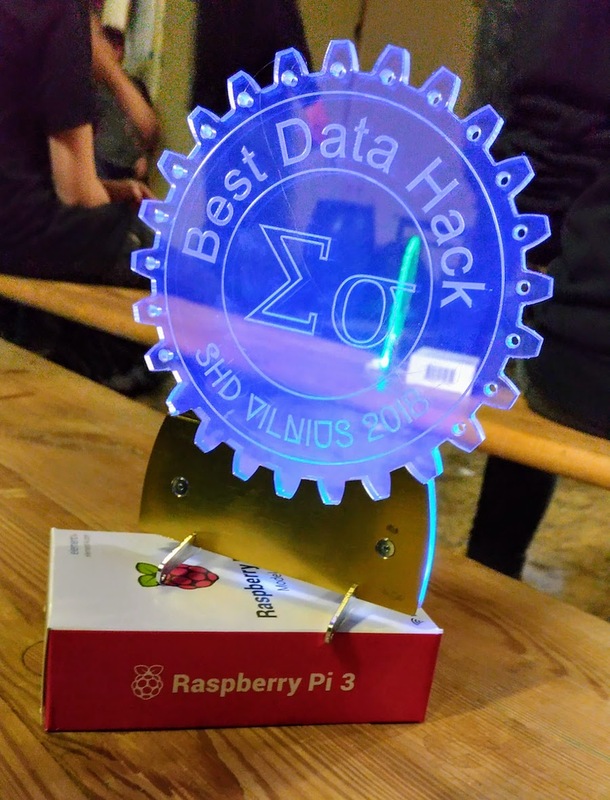 A trophy for the Best Data Hack 2018 and a Raspberry Pi. Our prizes for having fun! It’s always truly amazing to experience closely how creative and curious humans are! The event was awesome, well-organised, and, last but not least, fun. Organisers provided us all the materials (food included! ), borrowing me even the single USB-C adapter they had! 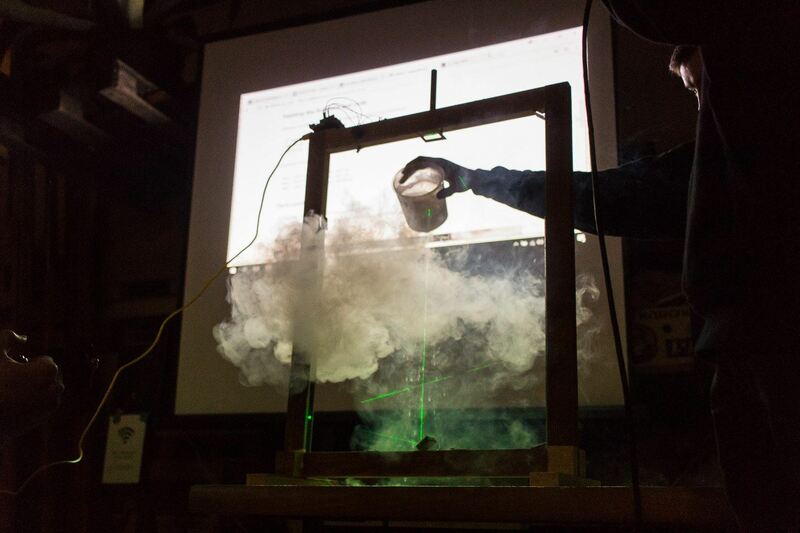 Clearly, the only intent behind Science Hack Days is for people to share and learn openly. And that has been achieved just right. Open knowledge is one of the most valuable things in this world. I have no doubt. I’m happy to have picked such an eccentric travel destination for my weekend, and really grateful for everything I saw and everyone I’ve met on the way. I don't feel my fingertips anymore since I did that. Writing in the snow: definitely NOT encouraged! Lithuania was freezing, yes, but people were warm.